I love a Salted Caramel Hot Chocolate at Starbucks, but it's not always an easy drink to find. It's 'seasonal'. So I went on line a few years ago to find the perfect copycat recipe. I found a great one at Bright Green Door. As always, I made a few adjustments. Here's a recipe for Salted Caramel Hot Chocolate that's perfect for winter weather and today's National Hot Chocolate Holiday. And, you'll save $5 by not going to Starbucks--and you'll stay out of the cold and the snow! Also, you can make this Salted Caramel Hot Chocolate any time of the year! You can also make a variation on this recipe to make a Salted Caramel Mocha. Mix Sugar, Cocoa, and 1 tsp Salt. Add water and boil for 1 minute. Add milk and heat until warm. Mix in Vanilla, Hazelnut Syrup, and Caramel Sauce. 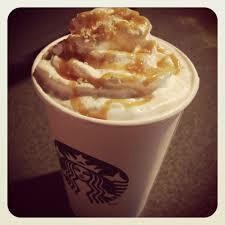 Pour into coffee cup and top with whipped cream, caramel drizzle, and sea salt.